Possession or Use of Narcotic Drugs – A.R.S. 13-3408. In Arizona, it’s illegal to knowingly use or possess a narcotic drug. The law is found in ARS § 13-3408(A)(1), which makes narcotic possession a class 4 felony. Common narcotics possession charges include possession of cocaine, heroin, crack, morphine, opiates, cannabis wax, and marijuana oils. Arizona law specifically defines what’s considered a narcotic drug. Narcotics are listed under ARS 13-3401(20). When charged with possession of narcotic drugs, you may also be charged with possession of drug paraphernalia under A.R.S §13-3415. The paraphernalia charge is a class 6 felony. Practically, it’s seen as a throw away charge since it’s a less serious offense. If you had a certain threshold quantity of narcotic drugs, or there’s evidence that you engaged in sales, you can face more serious charges—often which mandate prison. Arizona law has certain statutory thresholds that presume an intent to sell. Those thresholds are as follows: crack cocaine (750 milligrams); cocaine (9 grams); and, heroin (1 gram). What’s considered possession of Narcotic Drugs in Arizona? Narcotics possession requires actual or constructive possession with knowledge of the drug’s presence. State v. Donovan (Ariz. App. 1977). You must be in actual, constructive, or joint possession of the drug. Actual possession means that you have it on your person—such as in your hand, pocket, or backpack. Constructive possession is where the drug isn’t found on your person, but rather, in a place you exercise dominion and control over. State v. Floyd (Ariz. App. 1978). Lastly, joint possession applies where you shared narcotics with another person. For example, this might be where you shared a vehicle or room with someone. Penalties for Possession of Narcotic Drugs in Arizona. 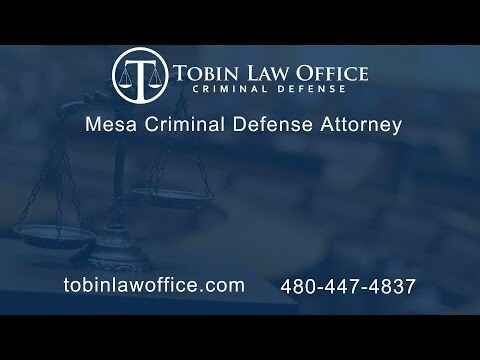 For most Defendants, working with an experienced Mesa criminal defense lawyer, narcotic drugs possession is usually reduced to an undersigned class 6 offense—also known as a 6 open. A 6 open can later be designated a misdemeanor upon successful completion of probation. Alternatively, your Mesa criminal defense lawyer can often negotiate entry into the TASC diversion program. Successful completion of TASC results in the complete dismissal of your case, leaving your record clean. As a class 4 felony, narcotic drug possession carries a prison range of 1 to 3.75 years. For most, however, probation is available and mandatory. With probation, a Defendant serves between 0 and 365 days in jail. Additionally, if convicted of Narcotic Drug Possession, you must pay a total fine of $3660, which includes surcharges. When granted probation, you must complete 360 hours of community service. The good news is that under Arizona’s Proposition 200, first and second time non-violent drug offenders cannot receive jail or prison for narcotics possession. Prop 200 mandates that jail cannot be imposed on first or second time non-violent drug offenders; the judge may only impose probation with fines, community service, drug testing, and drug treatment. To be incarcerated, you must have a prior violent conviction or two prior drug convictions. Due to these sentencing limitations, possession cases are frequently dropped to an undesignated felony or TASC diversion. If you’re not Prop 200 eligible, you face up to one-year jail with probation, or between 1 and 15 years in prison. The potential prison range depends on your criminal history. The more allegeable felonies on your record, the more prison you face. Common Resolutions in Narcotic Drug Possession Cases. Undesignated Plea Agreement (6 Open Agreement). Narcotic Drug charges are often reduced to an undesignated 6 open. An undesignated offense means that the conviction can be designated a misdemeanor upon successful completing of probation. In other words, you walk away with only a misdemeanor on your record. It’s usually 18 months of unsupervised probation, which subjects you to random drug testing. In a common 6 open agreement, it reads as follows: “Defendant shall be placed on unsupervised probation with compliance monitoring. The offense shall not be designated a misdemeanor unless and until the Defendant successfully completes probation. Defendant shall pay a fine of $1200 plus surcharges and shall complete 100 hours of community service.” The total amount owed, after surcharges fees, and assessments comes to about $2300, which can be paid in monthly installments. TASC Diversion Program. A common resolution in narcotic drug possession cases is TASC diversion. For most Defendants, the TASC program is preferred over a plea agreement because it avoids a criminal conviction, takes less time, and costs less money. The program is 12 months, as opposed to the usual 18 months of probation. Upon successful completion of TASC, the charges are dismissed and there’s no criminal record. TASC diversion is within the sole discretion of the prosecutor’s office. In many cases, a defense attorney can negotiate TASC for those with a limited criminal history. When TASC is agreed upon, you must meet with a TASC representative at the courthouse and make an admission to possession. The TASC program for Narcotic drugs is 12 months long. It involves 48 hours of self-help counseling, 24 hours of substance abuse counseling, a three-hour drug education seminar, random drug testing, and monthly contact with a case manager. You cannot use drugs or alcohol while in the program. The total cost of the program is about $2400 and each drug test costs $20. Participants can pay $200 per month. The random drug test centers are in Mesa, Glendale, North Phoenix, and Central Phoenix. For random drug testing, you’ll be assigned a color; each day a different color is announced; when your color is announced, you must report to a center for a drug test. You can only test positive for drugs that you have a valid prescription for. You may use marijuana if you have a valid marijuana card. The program also tests for alcohol. Missed appointments or untimely payments will delay completion of the program. Failure to attend the seminar or counseling sessions can result in your dismissal; furthermore, drug tests that demonstrate illegal drugs or alcohol will lead to your dismissal. Upon successful completion of the TASC program, your case is dismissed leaving you with a clean record. If TASC is not successfully completed, you must return to Court and the charges are reinstated for further prosecution. Even if your only goal is get into TASC, it’s wise to consult and hire a criminal lawyer. Felony prosecution is a confusing and intimidating process. Having a criminal lawyer smooths the procedure and clarifies confusion. In addition, a defense attorney can ensure that a client isn’t taken advantage of when there’s available defenses or shortcomings in the case. TASC diversion has particular and rigorous requirements that makes having an attorney important; your criminal lawyer can help you avoid common mistakes. When a client is dismissed from TASC, a criminal attorney can sometimes help a client get back in by speaking to the prosecutor. Common Defenses to Possession or Use of Narcotic Drugs. Constitutional Violation: The Constitution protect us from unlawful search and seizures and guarantees due process in criminal cases. Any violation of our constitutional rights may result in the suppression of evidence, and ultimately, dismissal of the charges. Constitutional violations are common in drug investigations. Police often rely on the evidence and statements obtained from illegal detainments, stops, seizures, searches, warrants, and custodial interrogations. Fruit of the Poisonous Tree. Any evidence discovered as result of an unconstitutional government act must be suppressed—this includes testimony, physical evidence, and admissions. Lack of Knowledge or Criminal Intent: The State must prove, beyond a reasonable doubt, knowing possession of the narcotic drugs. There’s many explanations or reasons you may not know about narcotics on your person, among your belongings, in your car, or in your residence. The Narcotic Drugs Belong to Someone Else. It’s common for there to be multiple suspects in a drug investigation. Many times, more than one person has access to the location where narcotic drugs are found. It’s often difficult for the prosecutor to prove possession when there are multiple people connected to the drugs. Mere Presence. Your mere presence where narcotics are found is insufficient to prove knowing possession or dominion or control over the narcotic drugs. State v. Mosley (Ariz. 1978); State v. Jung (Ariz. App. 1973); State v. Allen (App. 1969). Joint possession of narcotics cannot be solely based on the fact that you were with someone who had narcotics; there must be an additional independent factor linking you to the narcotics. State v. Hunt (Ariz. 1962). Problems in Testing the Narcotic Drugs. The prosecution must prove, beyond a reasonable doubt, that the substance recovered contains a chemical defined as a narcotic drug under Arizona law. A qualified forensic scientist must test a usable quantity of the drugs and confirm the presence of a narcotic substance. That same forensic scientist must be able to testify in Court. No Usable Amount of Narcotics. While it’s true that any amount of narcotic drugs is subject to prosecution, it must still be a usable amount. The amount of narcotics is only sufficient when the quantity is useable by known practices of addicts. State v. Moreno (Ariz. 1962); State v. Junkin (Ariz. App. 1979). Thus, if the amount recovered wouldn’t normally be smoked, ingested, or injected, the case should be dismissed. This is true even if the narcotic is identifiable by chemical analysis. State v. Ballesteros (Ariz. 1966). When there’s no usable amount, the State can technically move forward on a drug paraphernalia charge; however, it’s the county prosecutor’s policy to refer those matters to the city or justice courts for misdemeanor prosecution. No Chain of Custody for the Narcotic Drugs. The State must prove that the substance recovered at the crime scene is the same substance that’s in the courtroom. Thus, the prosecutor must account for every person that handled the drugs. They must also establish that the drugs were safe from mishandling or tampering. Sometimes, there’s a break in this chain which can result in a dismissal. In older cases, the drugs may be lost or destroyed by the evidence department. Confidential Consultation on Your Narcotic Drugs Charge. We can guide you through the daunting criminal process and explain how to avoid a conviction. Our consultations are free, friendly, and confidential. There’s never a sales pitch. Prospective clients are often surprised by how affordable it is to hire us for possession charges. It’s one of our most affordable services due to the consistency in the outcomes and criminal procedures.